Ok, so I have to say a bit about this. You likely noticed that the bricks are not strapped down. 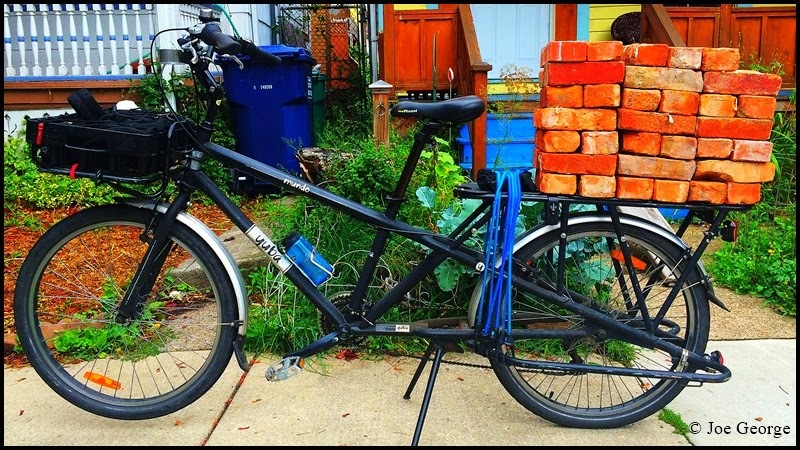 I didn't have to "ride" very far with these bricks, just about 4 houses away...actually I walked the bike. But hey, the bike still carried the bricks. They were curb-side and I am a sucker for free bricks...one can never have enough bricks. I was riding down the street when I spotted them, so I loaded them up and walked the bike home. I do believe I could have ridden the bike if they were propperly strapped down, but it would have been heavy. But this was an easy way to get all the bricks to my house in one trip.